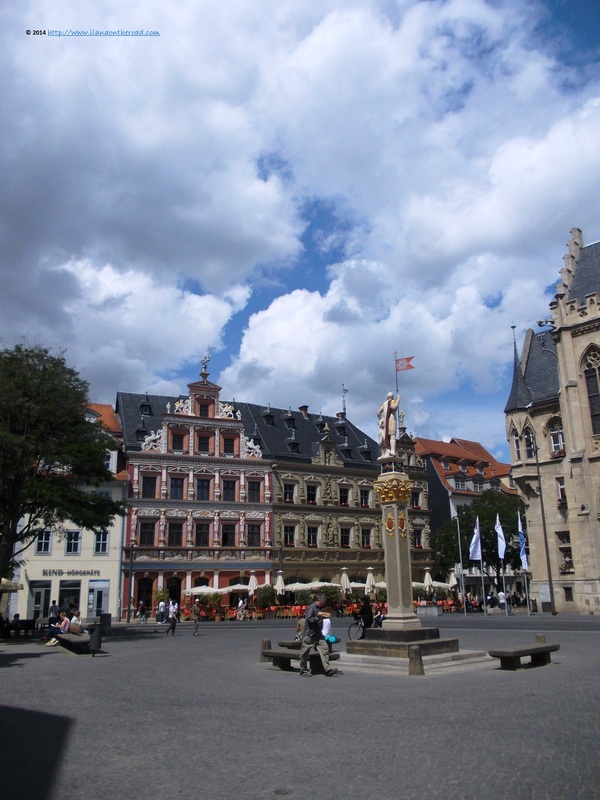 After the culturated Weimar and the very intellectually Jena, Erfurt was naturally the next destination in Thuringia and I wanted to visit this city at least 2 times in the last 4 months. But my travel experiences of the last year taught me that I better wait and go when I am ready for the meeting. And what a meeting it was: with beautiful architecture, a pleasant ambiance and many stories. The first one shortly upon arrival, about Willy Brandt - maybe my favourite German chancellor if you ask me - who visited the communist Erfurt in March 1970 - the first such German-German meeting after the creation of the Iron Curtain, opening the ways for the reunification a couple of decades ago. 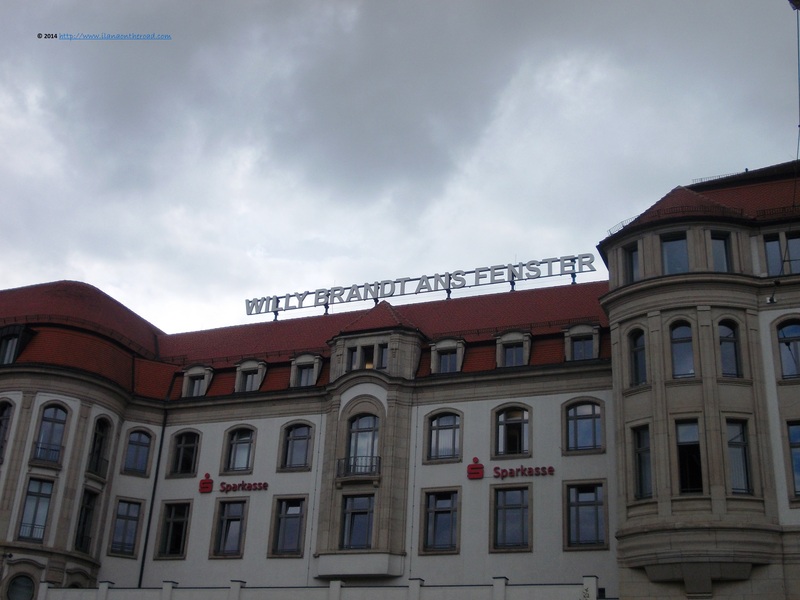 He appeared at the window - Willy Brandt ans Fenster! 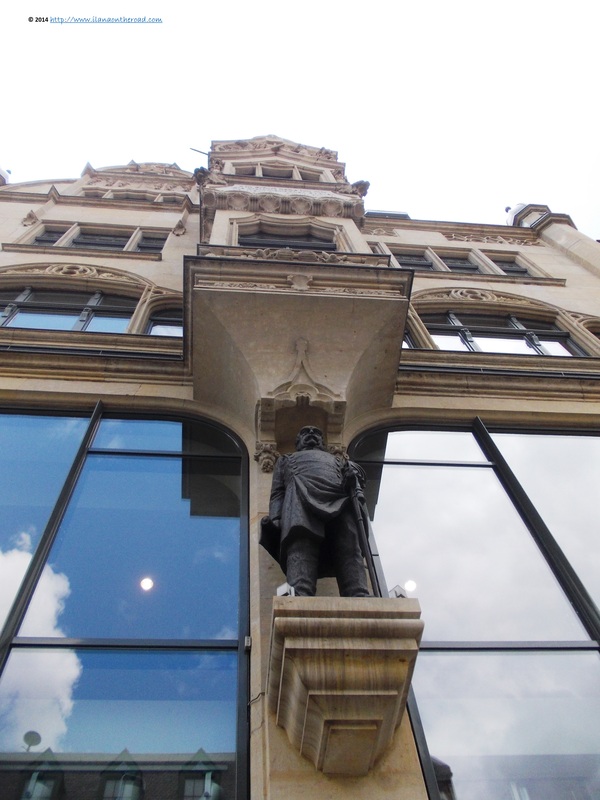 - of the building situated opposite the central station and the event is remembered since. The square - named after Willy Brandt - is right now a plaza with many restaurants and coffees, where to spend your free time in the summer. Once starting the exploration of Bahnhofstrasse and Anger boulevard, my camera hardly had any free time. 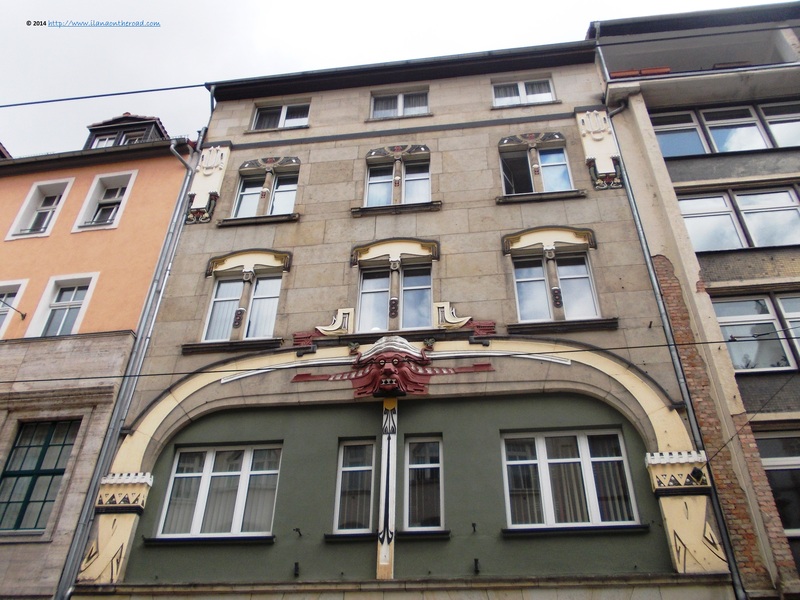 Buildings creatively mixing Art deco, baroque, Art nouveau influences introduced me to the eclectic universe of Erfurt. Although part of the GDR, the old city was not terribly affected by the typical grey urbanism plans. The new constructions are modern and playing rather with the volumes than with the facades, but with the exception of some outskirts areas, nothing destroyed the historical elegance of the city. One of my favourite places is Anger, because of the interesting architecture, but also because it offers anything you want to do as a short-term visitor in town: shopping avenue, restaurants - Vietnamese, German as well as Catalan cuisine are well represented - coffees, small bookstores and street musicians. On the same Anger, there is the Bartholomew Tower, built in the 12th century, whose carillon can be heard daily between 12 and 18 o'clock. 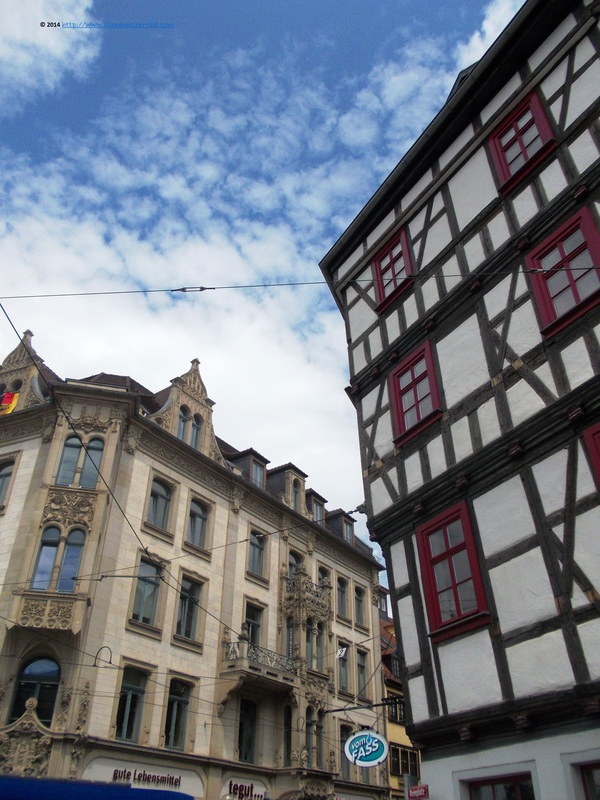 This part of the city is well covered by the mini-guided tours for tourists, mostly in German. 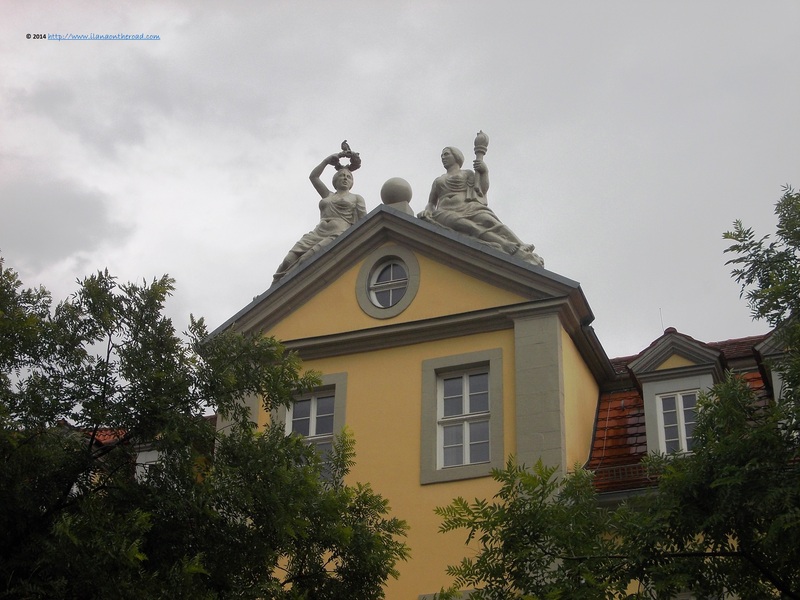 As everywhere in Thuringia, famous people like Schiller and Goethe visited and even lived in Erfurt too. 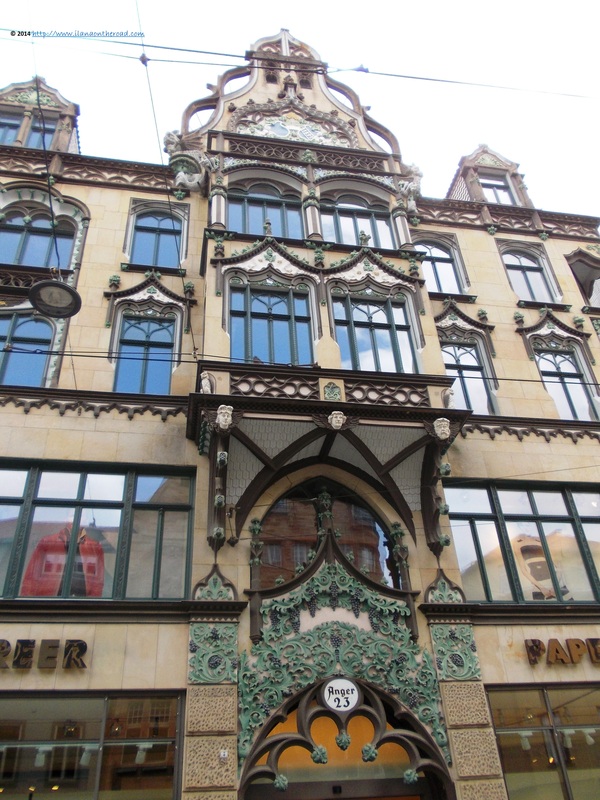 At the ground level of the beautiful buildings, one will often discover bakeries, such as Bretschneider, selling various sortiments of local pastry. From the central area of the old city, I arrived at the unexpected Art Nouveau apparition of the Presse Club, on Karl Marx Square. 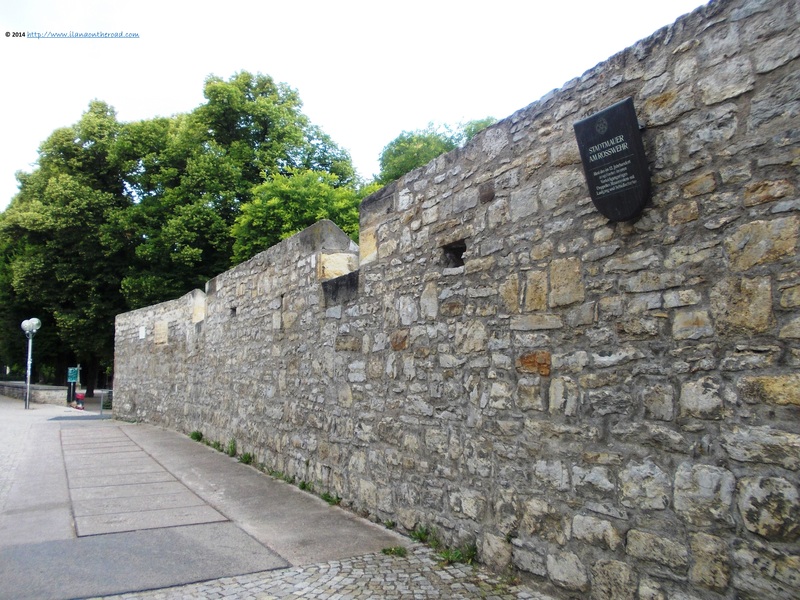 The city wall, built in the 12th century, can still be seen in various parts of the old city, intercalated between modern buildings or squares. One of the longest part is near the Bruehen Gardens, a green area with old trees, benches and playground whose silence was broken only by the phone conversations of the corporate men taking a talkative lunch break in the park. 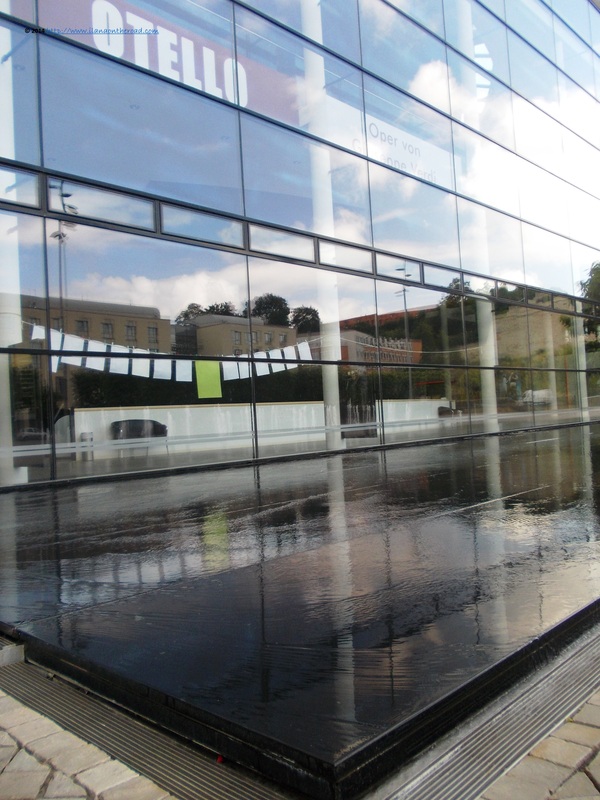 Another interesting presence is the local theatre, situated in the middle of a running water installation, that brings versatility to the glass and steel serious presence of the construction. 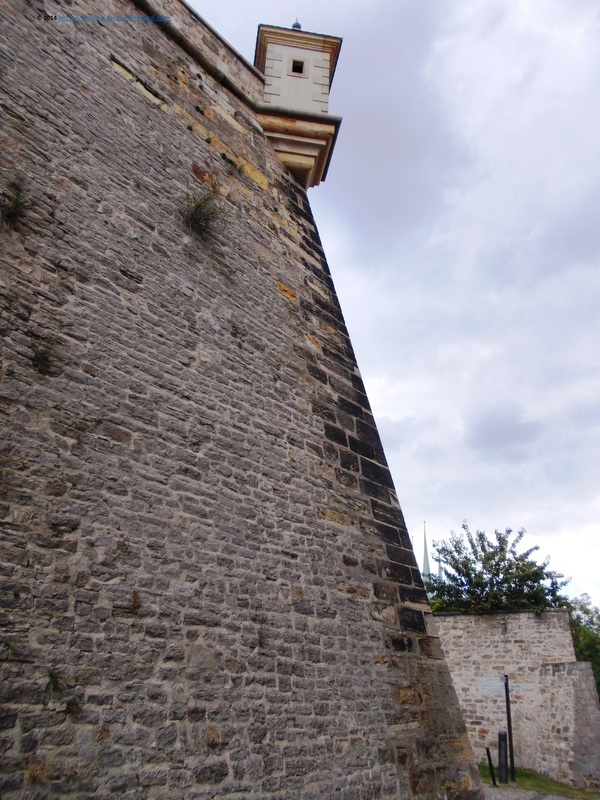 From there, I climbed the small stone stars, reaching the Martin Bastion, part of the bigger construction of Petersberg. 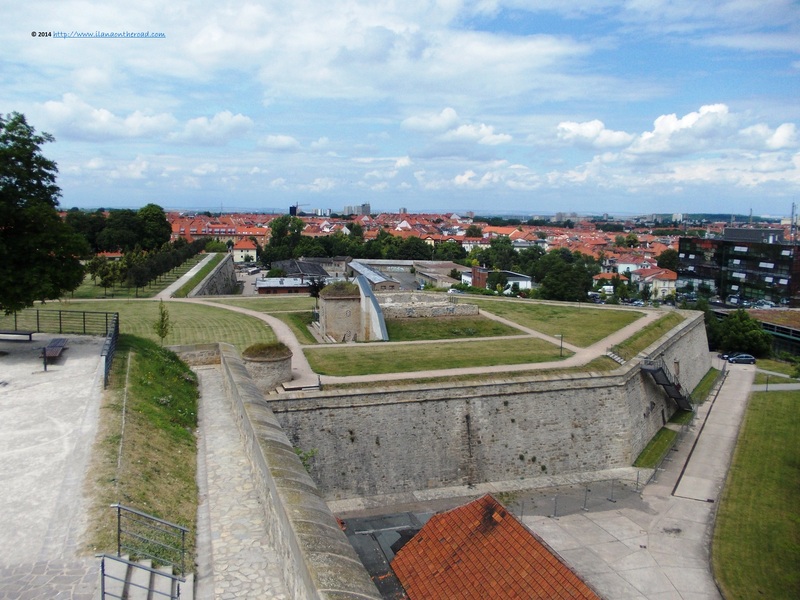 The Citadel is considered only extensively preserved baroque fortress in Central Europe. The view from the top introduced the diversity and many histories of the cities. The citadel itself is telling one of the many stories. Built on the site of a former monastery, standing upon a maze of passageways, it was more recently used as a political prison in 1933. The former intelligence services of the communist Germany, STASI, were situated nearby. An exhibition of military history can be visited, explaining the intricate relations between military and religious power in this part of Germany. A restaurant hosted in a glass building - Glasshutte - allows the visitors to have a lunch or only a coffee with a view over the city. Is was hard to leave the smell of freshly cut grass but the time was running and I still had so many things to see and learn about in Erfurt. 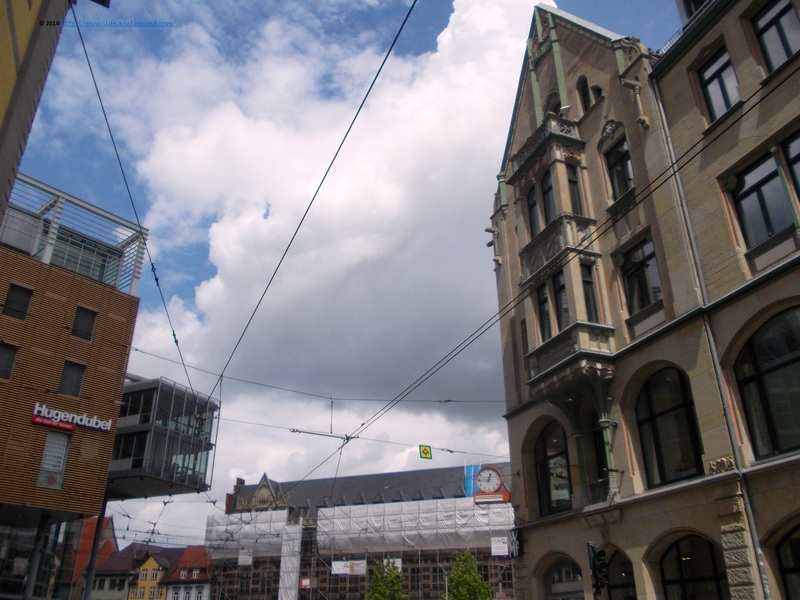 I arrive at Andreasstrasse, and further on, at the Domplatz, with even more details of the various histories of the city, well reflected by the different architectural style of the city. The city is part of the famous Via Regia, connecting the East and West of Europe for more than 2,000 years and 4,500 km. A symbol of the united Europe, with all its differences and historical memories. 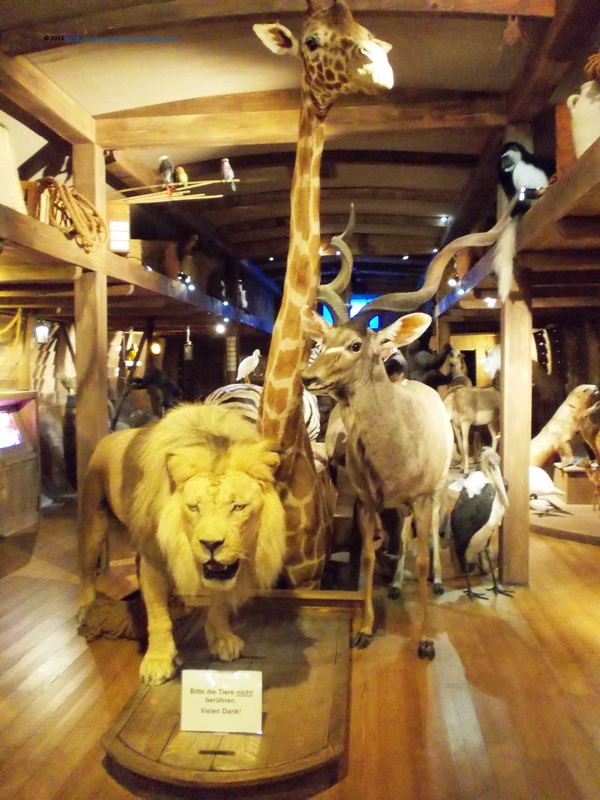 A landmark of the local museums is the Noah's Arch, exhibited at the Museum of Natural Sciences, a local reconstruction of the Biblical story. Besides, the museum also has an interesting collection of local stones as well as some insights into the fauna and flora of the region. Surprising, for the visitor used probably to encounter only stuffed animals in such a place, some small and very active mice are also part of the permanent exhibition. At least for the most part of my trip, the sun was shining, and I hardly resisted the temptation to take a seat and spend some time in the Domplatz or maybe at the Fishmarkt. I was feeling in the middle of a small Dutch or Belgian city, probably because of some French influences in the constructions, typical for this part of Germany. 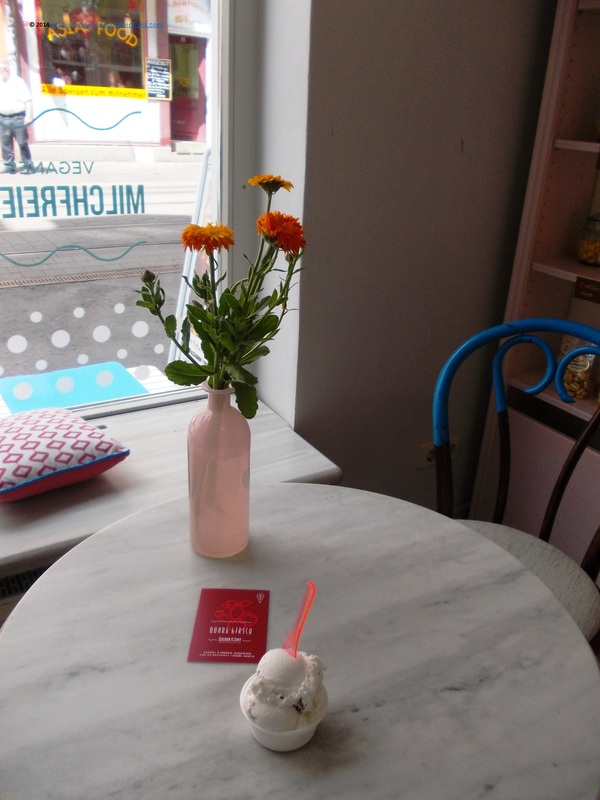 For now, I offered myself a scoop of vegan icecream, from Zucker und Zimt - Sugar and Cinnamon - a very tasty and good choice for the summer time. 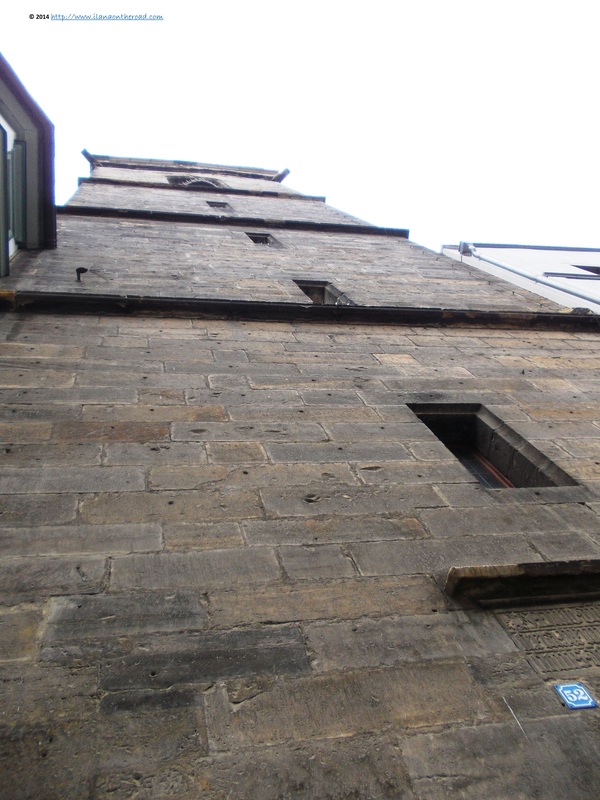 For centuries, Erfurt also had a Jewish life, nowadays mostly history. The first communities established around the 12th century, but were often wiped out because of pogroms. After the war, only 15 Jews returned from the concentration camps. Late after the end of the war, a synagogue was built here, the first in the GDR at the time. 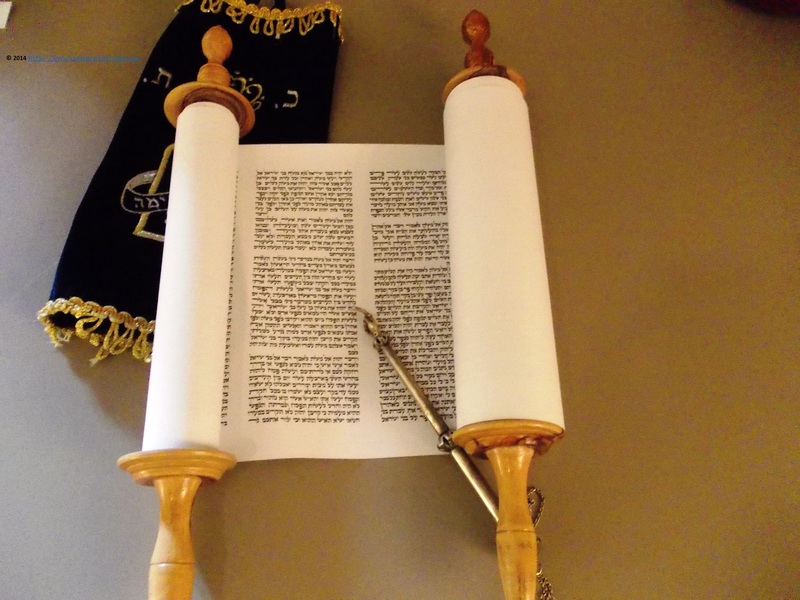 Nowadays, there is a small museum - within the former small synagogue nowadays a conference center that was in use only for a limited amount of time, between 1840 and 1884 - as well as at the old 12th century synagogue, considered the oldest standing Jewish religious building in Europe. There can be visited the Erfurt treasure, an exhibition of various coins and pieces of jewelry, probably from the time of the Black Death. The treasure was discovered by accident in the walls of a medieval neighbourhood in 1984. 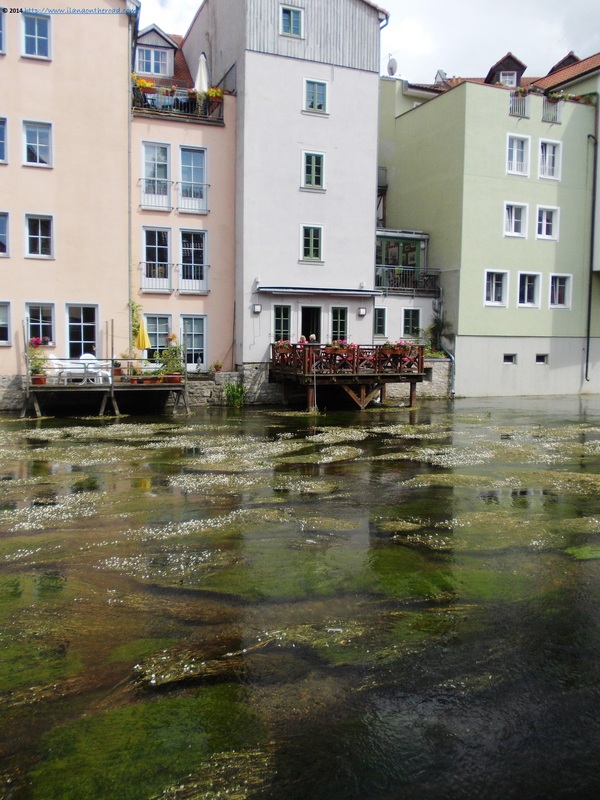 There are some unexpected corners of Erfurt, such this Venetian-like view near the Gera river. 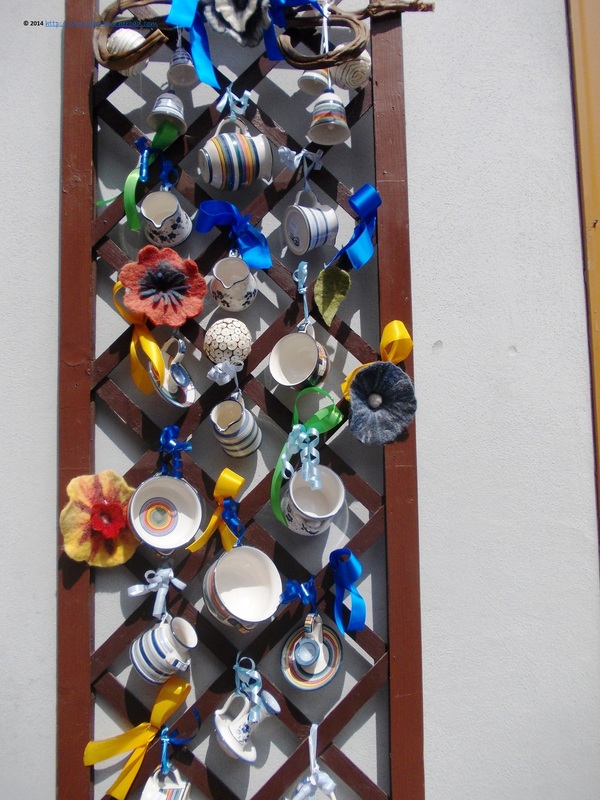 On the small streets around Krämer bridge there are plenty of small shops, selling form traditional clothing to pottery, icecream and spices. There is also the famous Krämer bridge, part of the Via Regia, originally built in the 12th century. 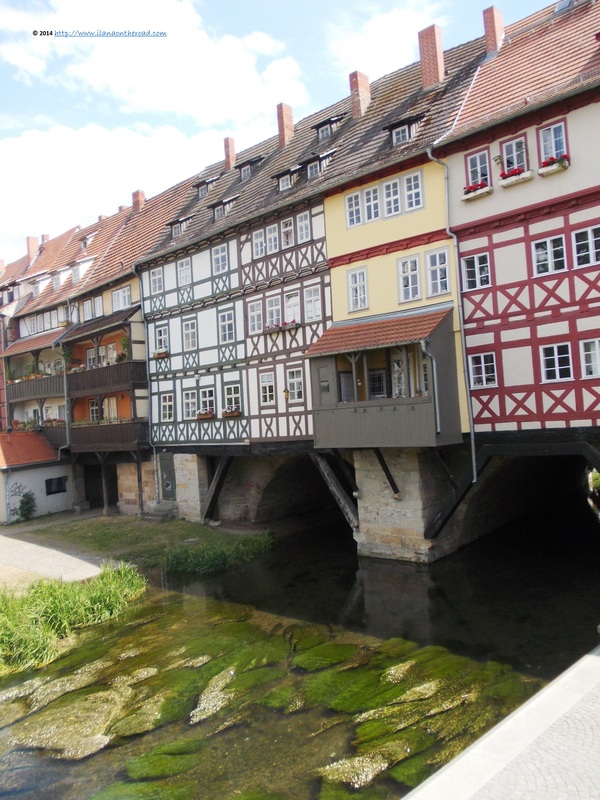 The half-timbered houses as well as the bridge itself, often consumed by fire during the centuries, were intensively protected during the communist times and now are the favourite area for organizing various local festivals and shows. 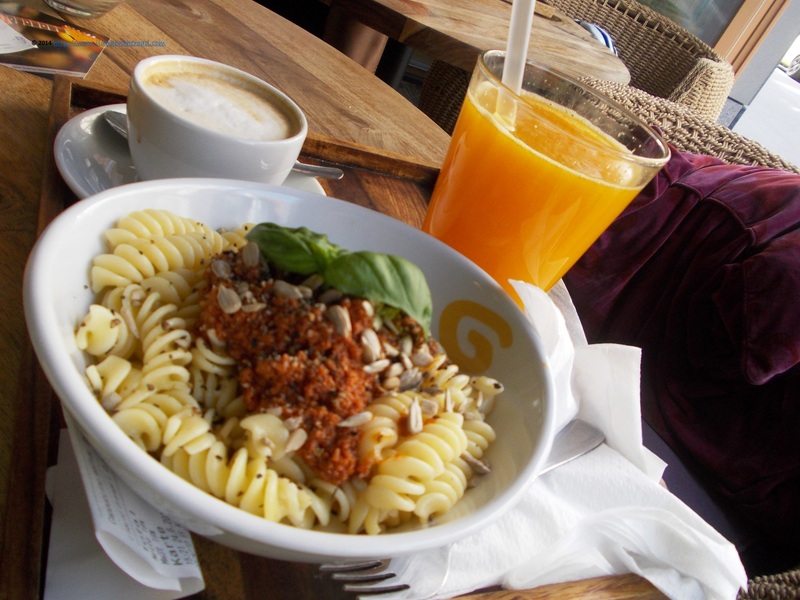 The city has a rich variety of organic and vegetarian restaurants, and I chose to have a delicious vegan pasta lunch at Cognito. The sunflower seeds and the fresh tomato sauce - although a bit salty - were more than welcomed after such an intensive journey. The restaurant offers also some books to read to the lonely visitors, and spend my dinner reading about Beuys opinions on advertising. 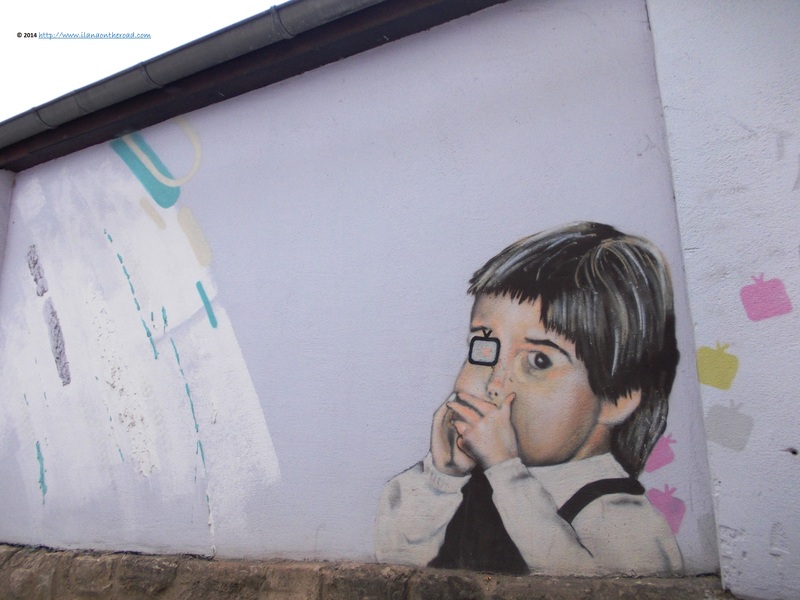 Before the hour of intensive rain, I had continued my discovery of the old and new streets of Erfurt, including some street art close to Waagegasse. When the rain went too far, I used a couple of free minutes visiting the small mustard museum. 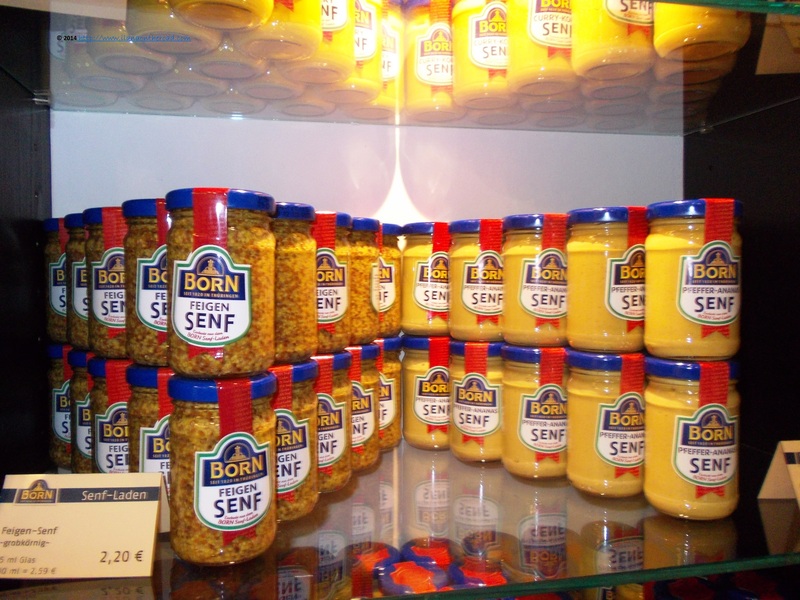 It is mostly a shopping point for products produced by the famous local company Born, with some insights about the history and the evolution of the tastes and products (such as the exotic figs mustard). 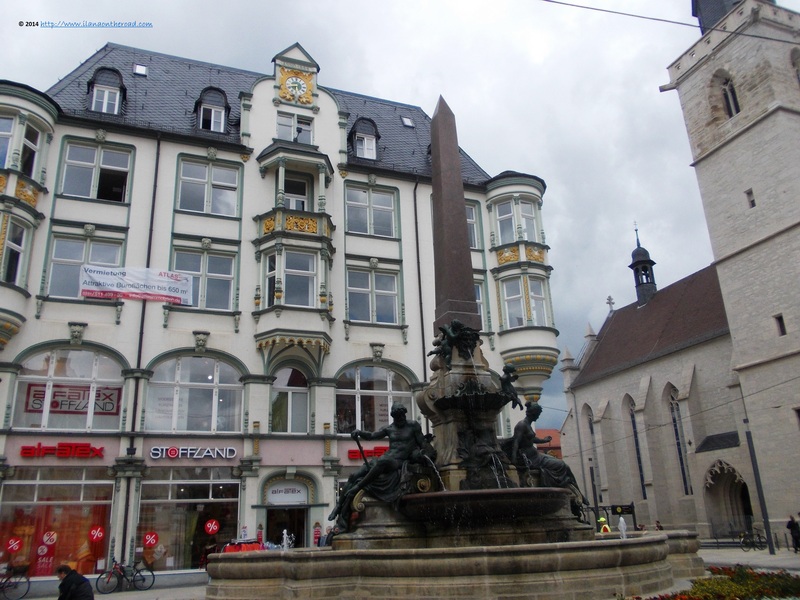 Although I said 'good bye' to Erfurt on a rainy hour - that did not stop me though to see some special buildings near the Central Station, hidden on Schmidtstedterstrasse - I know that I should come back soon. Some more intensive travel in Thuringia is also on the menu.